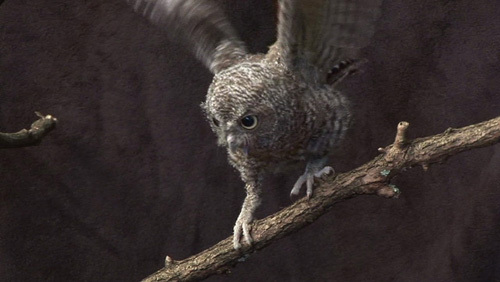 Pinkey was a funny, orphaned screech owl baby who lived in the tender care of Clyde, a certified wildlife rehabber in the Appalachian mountains of North Carolina. As an orphan with special needs, Pinkey needed extra help to become who he was meant to be. He developed a strong bond with his human “mama” Clyde, who used unorthodox rehab methods that we do NOT encourage others to use. Though traditional rehab wisdom says an imprinted bird cannot succeed on its own, thanks to Clyde’s intuitive, unconventional methods, Pinkey truly IS wild and free. And thanks to their unusual relationship, we have a rare chance to see into a wild raptor’s intelligence and personality. 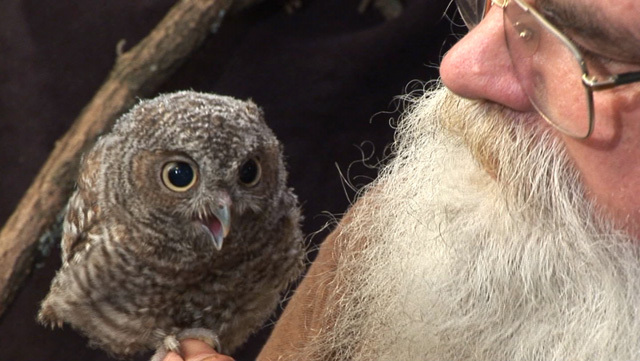 We hope this glimpse into Pinkey’s world inspires viewers to feel a deeper connection with and concern for screech owls, other raptors and all wildlife and to learn more about wildlife rehabilitation. Pinkey’s Pearl on YouTube Please play in HD – it’s amazing! Pinkey’s 30 second Pearl is now also included in a 8+ minute compilation, nestled with its four companion films in a rolling text story. We hope to make a shorter version with audio narration for children. All of the Wild and Free films, including the 8+ minute compilation, were premiered at an event on May 10, 2008 that also honored Clyde Hollifield. This event featured wildlife tales in film, storytelling and song, along with live raptors and other rescued wildlife. Though both Pinkey and his wilder friend Little Bit benefitted from Clyde’s rehabilitation skills and intuition, only Pinkey developed a strong bond with Clyde. Yet both he and Clyde recognized and honored his growing urge to be WILD and FREE! Both Clyde and Pinkey are magical, endearing characters. Their uniqueness is revealed through our lucky glimpse into their relationship. Pinkey’s story is beautiful and tender. It may also be controversial because his relationship with his rehabber Clyde went beyond the sanctioned federal rehabilitation guidelines. Clyde rehabilitated raptors for about 25 years. He retired from this much-loved but challenging work at the end of March 2007. The regulations had become too confining and too expensive for a volunteer who worked mostly with small owls. We at Little Pearls already knew and trusted Clyde through our filming of his therapy dog Dr. Willie. Willie is also a beneficiary of Clyde’s rehabilitation skills. We admire Clyde for his character and his many gifts, including the way he relates to animals and to nature. When he said this baby owl was special to him, we knew there probably was a “Pearl” in the relationship. 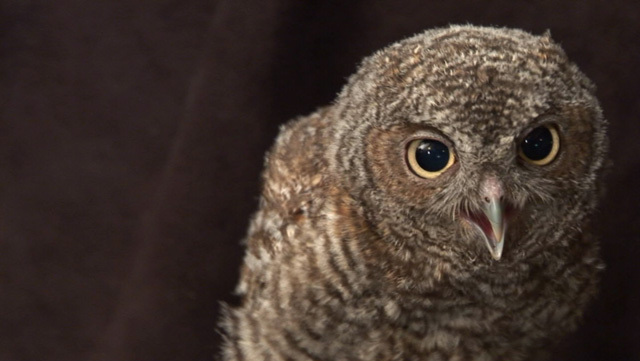 Pinkey is a particularly appealing ambassador from the world of owls because of his cute, goofy looks and behavior. He was named for his fuzzy eyelids, which were pink when he was tiny. Pinkey closed his eyes in an amusing way whenever he ate, and as a baby bird, he was, of course, eating frequently! Pinkey is a stand-in for all wild animals. Can we help people connect to THIS particular owl, thus encouraging them to care about and connect more with other wild animals? Humans can be deeply touched by wildness, and even entranced with a particular wild animal, without causing the animal to be “manned down,” ruining his or her ability to be wild and free. Pinkey needed the extra support from Clyde to become who he was truly meant to be. Clyde managed to help him through the non-sanctioned method of “soft release” (explained below). However, Clyde was also trained and certified in traditional methods and knew how to apply them with great skill and creativity. We do NOT intend to encourage people to copy Clyde – DO NOT DO THIS AT HOME! We DO encourage anyone who encounters an animal in need of help, to do so in an appropriate way. We have provided links to wildlife organizations which offer great information. Any of us can either learn how to help wild animals ourselves, as Clyde did, or how to take an animal to a trained rehabber. We encourage more people to learn about wildlife rehabilitation. Nature centers, wildlife education and rehabilitation organizations and habitat preservation organizations deserve our strong support, financially and otherwise. Three Pearl companion videos from our two filming sessions provide more glimpses into the relationship between Pinkey and Clyde, and also into the process of “soft release.” It was a privilege to be in the presence of Pinkey and his rehab friend Little Bit, both of whom were returning only sporadically from their sojourn in the woods at the time of the second filming. The images in the Pearl itself and in the companion videos are from Pinkey’s pre-release footage in late June 2005 and from footage of Pinkey and Little Bit during “soft release” in early August 2005. We have some amazing slow motion footage, including Pinkey and a very bold hummingbird! Pinkey and Clyde both worked hard on Pinkey’s survival skills. Pinkey did in fact wean himself away from any dependence on Clyde, except for occasional calls from the dark woods for awhile after release. 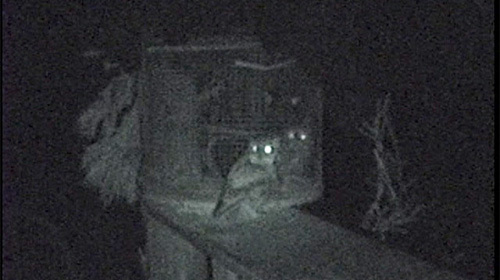 Little Bit was courted by another owl and disappeared for good, shortly after we did the filming outside. The fourth Pearl companion comes from unanticipated night vision home video. Captured by Clyde 18 months after Pinkey’s release, this grainy but touching video proves that Pinkey was in fact living successfully in the wild on his own. He surprised Clyde by coming back in January 2007 after a long absence, to tenderly court an injured female screech owl in Clyde’s care. The video is bittersweet, as the female named Princess was too restless, kept re-injuring herself and eventually died. Pinkey disappeared for the next five months. The officially sanctioned approach, especially when a licensed rehabber must abide by federal government permits and regulations: in this approach, a close connection or relationship between human and animal (talking to them, giving them a name, handling them beyond what is necessary) is not allowed and is considered to be potentially harmful. When deemed ready for release, animals are set free and do not return. Therefore, unless they are tagged in some way, their status cannot be observed. Clyde calls this approach “hard release” because he believes it is harder on the animal and less likely to be successful in many cases. “Soft release,” an alternative, grassroots approach that is more like the natural parenting style of many people and animals: in this approach, an animal or bird is treated in a way that encourages trust. Clyde says this helps them feel safe enough to come back for awhile for food, giving them time to grow in strength and skills until they are ready to wean themselves away. He thinks this gives animals a better chance to survive. It also gives the rehabber a chance to evaluate how they are doing. Clyde says they rarely return or get too comfortable with humans, as the connection they had was with one human only: their rehabber. Even that connection usually fades, once the animal is successfully returned to the wild. Clyde does not believe this method increases the chance of potentially dangerous familiarity with humans in general. He has used soft release primarily with orphaned baby raptors because they are social birds and need parental training to learn hunting, other survival skills and confidence. With older animals, whether sick or injured, it may not be as suitable. Raptor rehabilitation as a science is only about 50 years old; Clyde has done it for 25 of those years. He says rehabbers are still learning what really works. Transcendent, unexpected magic: this occurs when something rare and special just “clicks” between a human and a wild animal in rehab. When it does happen, it offers the potential for relationship on a deep level, even as the human helps the animal become – or stay – wild. Such was the case with Clyde and Pinkey. Are they just resources or tools to be used – or enjoyed – by us? How much are they like us, these “other-than-humans?” What are we doing when we attribute human qualities to them? Is there a hierarchy of value, with humans at the top? Or are we related to animals in a different way, with each of us having a unique place in a relationship shaped more like a circle? Can we “own” another part of nature? Or another living being? Do humans – or some aspects of us – long to be part of the “wild and free” world, too? By becoming so “civilized,” have we lost something of value? How DO humans interact with Nature in ways that are mutually beneficial, instead of harmful? All these questions and more deserve thoughtful exploration. Perhaps Wild and Free, its companion videos and its web pages can be part of that process. We released Pinkey’s longer videos in Spring, the time of year when many baby wild ones become lost from their parents, then found and handled by people. Spring is a good time to make the point that wildlife are meant to be wild, even if they need our help for awhile. A postcript: Now Pinkey only visits once in awhile, calling from the trees to chat with Clyde. There is still a bond, but Pinkey stays out of sight. Thanks to Clyde, Pinkey has made it on his own: he truly IS Wild and Free! Everyone can do something to ensure that our children will always have wildlife to enjoy, and that wildlife can live as they are meant to live: healthy, wild and free!